The blaster's plunger can pull the user's skin during firing of the toy blaster, resulting in injury to the face, neck, and/or chest. This recall involves about 330,000 Nerf N-Strike Recon CS-6 Blasters for children age 6 and up. The toy blaster is yellow with a black handle and orange plunger, trigger, and reload clip. 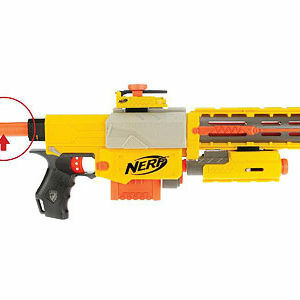 The word "NERF" in black lettering is on both sides of the blaster and the word "ARMED" is indented on the orange plunger. "RECON CS-6" is on the gray cocking mechanism. There are five interchangeable parts including the shoulder stock, the flip-up sight, barrel extension, quick re-load clip, and dual-mode light beam. Model number 63552 and UPC codes 653569272021 and 653569311218 can be found on the packaging. Wal-Mart, Target, Toys "R" Us, discount stores, and toy stores nationwide from November 2007 through August 2008 for about $20. Immediately take the recalled toy blasters away from children and contact Hasbro for a free cylindrical cover to prevent additional injuries. For more information, contact Hasbro toll-free at (800) 245-0910 anytime or visit their Web site at www.hasbro.com/nerf.